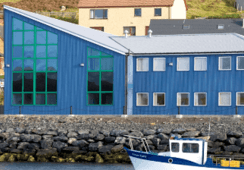 Lerøy Seafood, co-owner of Scottish Sea Farms, has been granted just one of the nine development licences it had applied for to test out its new Pipe Farm concept in Norway. 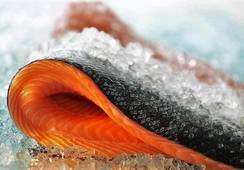 Nine development licences would have allowed Lerøy to grow an extra 7,020 tonnes of salmon, but the decision by Norway's Fisheries Directorate means the firm will only be allowed an extra 450 tonnes. 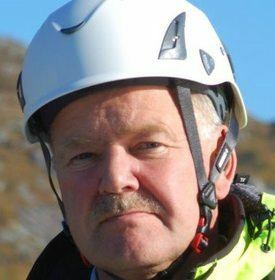 Stig Nilsen, chief executive of aquaculture in Lerøy Seafood Group, told Fish Farming Expert's sister site, kyst.no: "We are very surprised by the conclusion. 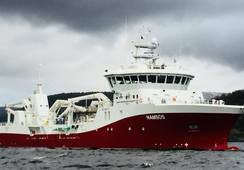 "Now we need to spend some time to go through and consider the reasoning of the Fisheries Directorate, before we consider further process on our part." The Pipe Farm structure consists of three sections, and the production of fish occurs in the centre section, an area of 3,000m³. In the application, it emerges that it is planned to use two such tubes parallel to one another, giving a total production volume of 6,000m³, and making use of a common truss / stiffener, saving both costs and material usage. Lerøy's 91%-owned subsidiary, Preline Fish Farming Systems AS, owns the rights to the technology in the project. In cooperation with Lerøy it built a pilot called Preline in 2014. The structure has a total internal volume of 2,000m³ (all three sections). 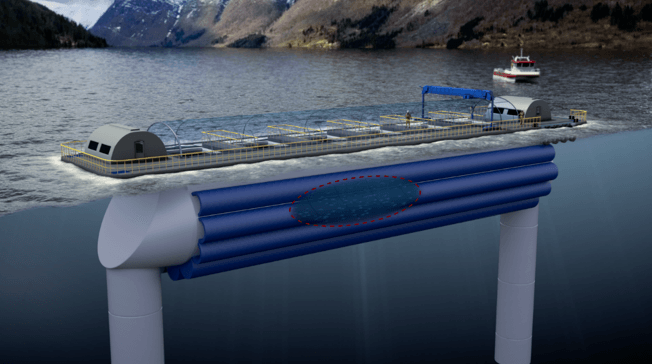 Originally Lerøy wanted to develop and test the Pipe Farm in three different locality types - sheltered fjords, open coastal waters and the Arctic. The nine licences applied for were to be divided evenly between locality types. Because of the different degree of exposure to environmental loads, the Pipe Farms planned for the different areas are not identical. Explaining the reasons for its decision, the Fisheries Directorate writes that it believes one Pipe Farm structure should be designed to withstand the environmental forces at the three different locations, and it therefore does not see any reason why more than one version should be built. From a technological point of view, it argues there are therefore no grounds for granting development permits to realise several production units. From an economic point of view, it would according to the calculations cost between NOK 77 million and NOK 91.4m to build two units in one locality. By building just one device, the cost will be NOK50-60m. 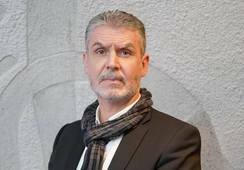 The Fisheries Directorate writes that the cost is set against the value that a possible conversion of the development licences [to permanent licences] will represent for Lerøy, and after the assessment it only sees it "necessary" to grant one permit of 450 tonnes of maximum permitted biomass. "This will be sufficient to develop the appropriate technology in the concept and make a trial of this at commercial scale." In its application, Lerøy explains that to solve the problem with poor water flow in sheltered fjord sites, a “current/flow of water” will be maintained through the production chamber, using a flow-supply in each end section. The flow will be laminar (where the water flows in parallel layers). One supplier provides fresh sea water, while the other contributes by drawing the water out from the production chamber. Under each end section, there will be large vertical pipes, so-called "socks", which extend into the water depth. 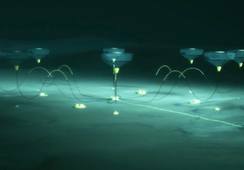 It will be possible to raise or lower the pipes between 20 and 35 metres down, to optimise the temperature of the water taken in, while also ensuring that the intake and effluents are mixed to a minimum extent. 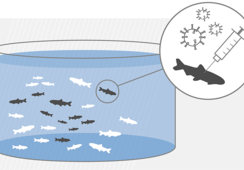 To prevent the fish from escaping the production chamber will have a grid at the end. There will also be secondary protection, a kind of fabric dome, at the lower end of the intake / outlet pipes that also prevents jellyfish and algae from entering the unit. What makes the concept unique is the long-run tube, which gives approximately laminar current/flow and a very fast water exchange of 4-6 minutes against 40-100 minutes in round closed systems.